When Maybole Had Boot Power! Ayrshire Post. August 10, 2001. Edwin Lawrence looks back to the days of a thriving town that led the British Empire in shoemaking. AMAZING how a wee snippet of information on Maybole can set you thinking! In this case it was an item in the Postscript column which features on the Ayrshire Post's letters page. Under the heading `100 Years Ago' were census returns from 1901, showing Maybole as the second-biggest town in South Ayrshire. 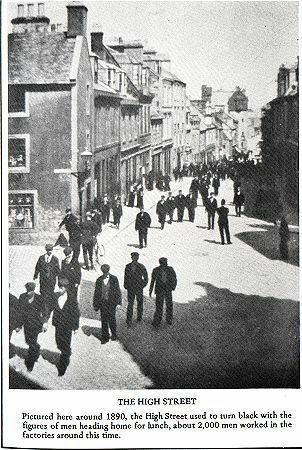 South Ayrshire was more of a geographic term in those days, as local government was by burgh councils and Ayr County Council. But the point is that Maybole was an important centre of influence. The town's 1901 population was 7,852 - more than 300 up on the 1891 figure of 7,532. Compare that with these Ayrshire towns in 1901 (1891 figures in brackets): Girvan - 4,867 (4,906); Troon - 5,113 (3,781); Monkton and Prestwick - 3,854 (2,605); Cumnock - 5,143 (4,713). Boot and shoe making helped give Maybole its large population, and the town was the hub of an area that employed hundreds more in agriculture, weaving and mining. Dailly's population in 1901 was 1,673 (1,809 in 1891); Kirkoswald's was 1,450 (1,477); Crosshill's 1,108 (1,176); Dalrymple's 931 (1,018); and Kirkmichael's 839 (885). The village figures seem to indicate a steady move away from the land into manufacturing jobs in the towns. But the landward area was still vibrant, and if you add in people from Straiton, Minishant, Dunure, Maidens and Turnberry, the Maybole area population must have exceeded 16,000. That's a healthy figure in the Britain of 1901, when there were around 25 million fewer people on these islands. Maybole a century ago was a bustling manufacturing, retail and social centre. Railway travel had reached the town way back in 1857, and the present station was built in 1880. 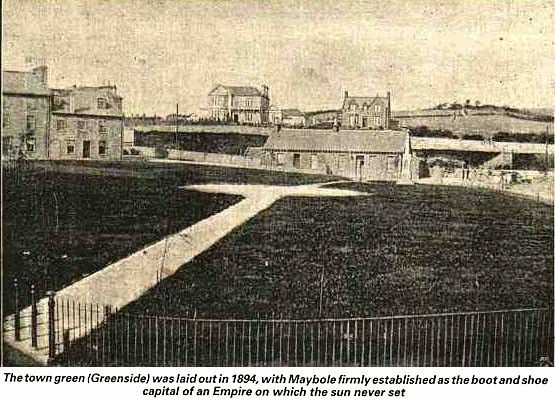 The Town Hall was built on to the tower of the old tolbooth in 1887, and the Town Green (Greenside) was laid out in 1894. These improvements showed a town with plenty of civic pride, and further advances came early in the 20th century with a new public library (1906) and a new Post Office (1913). Not that everything in the garden was rosy. The Maybole of 1901 (like other towns in Britain) had a poorhouse and a high infant mortality rate. But it had more civic clout than today. Maybole didn't even figure on a list of 19 Ayrshire `principal towns' (populations of 5,000 and over) in an Enterprise Ayrshire leaflet of a couple of years ago. In South Ayrshire terms, Maybole is the smallest of the area's five main burghs (behind Ayr, Troon, Prestwick and Girvan). Hundreds of Maybole people now have to leave the town every day to get to their places of work. And there's no specialised shoe shop in a town that was once the boot and shoe capital of the British Empire. Maybole is sometimes regarded as a dormitory town - or worse still, a dormitory suburb of Ayr! But the town still has something important going for it - and that can be summed up by the word `community'. Maybole has a community council that is regarded as a benchmark for others and a com­munity association that organises events like the gala day. A new community development group offers hope of boosting the town's economic fortunes. Maybole also boasts dozens of other community-oriented groups that all help main­tain its unique identity. So although Maybole isn't the place it was - for better and worse - it still has an identity that many would envy.